We’d love your help. Let us know what’s wrong with this preview of Wicked Welcome by Ginger Elinburg. One phone call was all it took to change her life forever. When Morgan gets the house of her dreams, she never suspected it would become the house from her nightmares. As strange events begin to unfold, she starts to question her own sanity. Morgan couldn’t control the shiver that was coursing through her body, as she remembered how her friend, Maddison, had pulled fists f One phone call was all it took to change her life forever. Morgan couldn’t control the shiver that was coursing through her body, as she remembered how her friend, Maddison, had pulled fists full of her own hair out by the roots. By the time they had gotten her restrained, she had nothing left but a bloody scalp with a few clumps of hair hanging on thin strips of flesh. Morgan shook her head to clear her thoughts. “No, I don’t think I’m crazy. To ask other readers questions about Wicked Welcome, please sign up. I enjoyed reading Ginger Elinburg's Wicked Welcome. The novel was entertaining, creepy, and included relatable characters. Elinburg throws her readers into a supernatural world filled with ghosts and other forces of evil, all the while keeping the main characters grounded as they search for answers to the unexplainable. 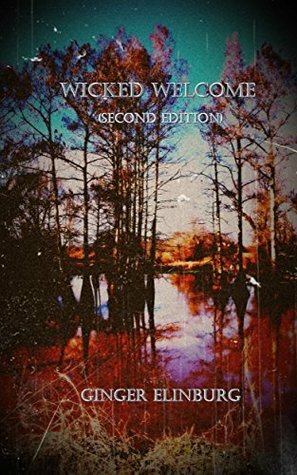 While perhaps some improvements could be made to this novel, Wicked Welcome is proof that Ginger Elinburg is in fact a talented author and story-teller. If you enjoy reading horro I enjoyed reading Ginger Elinburg's Wicked Welcome. The novel was entertaining, creepy, and included relatable characters. Elinburg throws her readers into a supernatural world filled with ghosts and other forces of evil, all the while keeping the main characters grounded as they search for answers to the unexplainable. The plot of this story has great potential. The main character and the craziness happening in this haunted house has such potential. The writing however needs work, not so much the voice of the story but editing. I however would still like to continue and see what is going on in the end with Mary, Marie and the mystery of the other characters. I greatly enjoyed this book. It was a bit slow to star, but once it gained momentum I couldn't stop reading. I ended up devouring this book in a night! Really nicely done for a first time author. Fast paced book that was very good. Morgan is handed a gold platter with anything and everything on it, along with ghost. The ending came to quick.